This article is about a province of South Africa. For other uses, see Zululand (disambiguation). For the school abbreviated KZN, see Kantonsschule Zürich Nord. 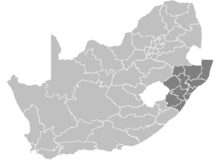 KwaZulu-Natal (/kwɑːˌzuːluː nəˈtɑːl/; also referred to as KZN and known as "the garden province"; Zulu: iKwaZulu-Natali; Xhosa: KwaZulu-Natal) is a province of South Africa that was created in 1994 when the Zulu bantustan of KwaZulu ("Place of the Zulu" in Zulu) and Natal Province were merged. It is located in the southeast of the country, enjoying a long shoreline beside the Indian Ocean and sharing borders with three other provinces and the countries of Mozambique, Eswatini and Lesotho. Its capital is Pietermaritzburg and its largest city is Durban. It is the 2nd most populous province in South Africa, with slightly fewer residents than Gauteng. During the 1830s and early 1840s, the northern part of what is now KwaZulu-Natal was occupied by the Zulu Kingdom while the southern part was, briefly, the Boer republic of Natalia before becoming, in 1843, the British Colony of Natal. KwaZulu remained independent until 1879. KwaZulu-Natal is the birthplace of many notable figures in South Africa's history, such as Albert Luthuli, the first non-white and the first person from outside Europe and the Americas to be awarded the Nobel Peace Prize (1960); Pixley ka Isaka Seme, the founder of the African National Congress (ANC) and South Africa's first black lawyer; John Langalibalele Dube, the ANC's founding president; Harry Gwala, ANC member and anti-apartheid activist; Mangosuthu Buthelezi, the founder of the Inkatha Freedom Party (IFP); Anton Lembede, the founding president of the ANC Youth League; Jacob Zuma, the former President of South Africa; and Bhambatha, a 19th-century Zulu chief who became an anti-apartheid icon. Two areas in KwaZulu-Natal have been declared UNESCO World Heritage Sites: the iSimangaliso Wetland Park and the uKhahlamba Drakensberg Park. At around 92,100 km2 in area, KwaZulu-Natal is roughly the size of Portugal. It has three different geographic areas. The lowland region along the Indian Ocean coast is extremely narrow in the south, widening in the northern part of the province, while the central Natal Midlands consists of an undulating hilly plateau rising toward the west. Two mountainous areas, the western Drakensberg Mountains and northern Lebombo Mountains form, respectively, a solid basalt wall rising over 3,000 m (9,800 ft) beside Lesotho border and low parallel ranges of ancient granite running southward from Eswatini. The area's largest river, the Tugela, flows west to east across the center of the province. The coastal regions typically have subtropical thickets and deeper ravines; steep slopes host some Afromontane Forest. The midlands have moist grasslands and isolated pockets of Afromontane Forest. The north has a primarily moist savanna habitat, whilst the Drakensberg region hosts mostly alpine grassland. The province contains rich areas of biodiversity of a range of flora and fauna. The iSimangaliso Wetland Park and the uKhahlamba Drakensberg Park have been declared UNESCO World Heritage Sites. The iSimangaliso Wetland Park, along with uKhahlamba Drakensberg Park and Ndumo, are wetlands of international importance for migratory species, and are designated as Ramsar sites. South Africa signed the 1971 Ramsar Convention to try to conserve and protect important wetlands because of their importance to habitats and numerous species. The former Eastern Cape enclave of the town of Umzimkulu and its hinterland have been incorporated into KwaZulu-Natal following the 12th amendment of the Constitution of South Africa. The amendment also made other changes to the southern border of the province. The northwesterly line of equal latitude and longitude traverses the province from the coast at Hibberdene (30°34′35″S 30°34′35″E﻿ / ﻿30.57639°S 30.57639°E﻿ / -30.57639; 30.57639) to northeast Lesotho. KwaZulu-Natal has a varied yet verdant climate thanks to diverse, complex topography. Generally, the coast is subtropical with inland regions becoming progressively colder. Durban on the south coast has an annual rainfall of 1009 mm, with daytime maxima peaking from January to March at 28 °C (82 °F) with a minimum of 21 °C (70 °F), dropping to daytime highs from June to August of 23 °C (73 °F) with a minimum of 11 °C (52 °F). Temperature drops towards the hinterland, with Pietermaritzburg being similar in the summer, but much cooler in the winter. Ladysmith in the Tugela River Valley reaches 30 °C (86 °F) in the summer, but may drop below freezing point on winter evenings. The Drakensberg can experience heavy winter snow, with light snow occasionally experienced on the highest peaks in summer. The Zululand north coast has the warmest climate and highest humidity, supporting many sugar cane farms around Pongola. In 2012, the Ingonyama Trust owns 32% of the land in KwaZulu-Natal, in many municipalities. This amounts to about three million hectares, occupied by over 4 million people. The Zulu king is the chairman of the Trust. The coastline is dotted with small towns, many of which serve as seasonal recreational hubs. The climate of the coastal areas is humid and subtropical, comparable to southern Florida in the United States, but not quite as hot and rainy in the summer. As one moves further north up the coast towards the border of Mozambique, the climate becomes almost purely tropical. North of Durban is locally referred to as "The North Coast", while south is "The South Coast". The Kwazulu-Natal Tourist board includes towns such as Margate, Port Shepstone, Scottburgh and Port Edward in its definition of the South Coast, while Ballito, Umhlanga and Salt Rock are North Coast resort towns. Beaches of world-class quality are to be found along virtually every part of South Africa's eastern seaboard, with some of the least-developed gems found in the far southern and far northern ends of the province. Marina Beach (and its adjoining resort San Lameer) was recognised in 2002 as a Blue Flag beach. Some visitors come for the annual late autumn or early winter phenomenon on the KwaZulu-Natal coast of the "sardine run". Referred to as "the greatest shoal on earth", the sardine run occurs when millions of sardines migrate from their spawning grounds south of the southern tip of Africa northward along the Eastern Cape coastline toward KwaZulu-Natal. They follow a route close inshore, often resulting in many fish washing up on beaches. The huge shoal of tiny fish can stretch for many kilometres; it is preyed upon by thousands of predators, including game fish, sharks, dolphins and seabirds. Usually the shoals break up and the fish disappear into deeper water around Durban. Scientists have been unable to answer many questions surrounding this exceptional seasonal event. There is a lovely road that runs from Ixopo into the hills. These hills are grass-covered and rolling, and they are lovely beyond any singing of it. The road climbs seven miles (11 km) into them, to Carisbrooke; and from there, if there is no mist, you look down on one of the fairest valleys of Africa. About you there is grass and bracken and you may hear the forlorn crying of the titihoya, one of the birds of the veld. Below you is the valley of the Umzimkulu, on its journey from the Drakensberg to the sea; and beyond and behind the river, great hill after great hill; and beyond and behind them, the mountains of Ingeli and Griqualand East. The Portuguese explorer Vasco da Gama saw the coast of Natal on Christmas Day 1497. Natal is the Portuguese word for Christmas which gave rise to the European name for the region. The area was occupied centuries ago by the Nguni branch of the Bantu. The first European settlers, mostly British, established Port Natal, a trading post. They made almost no attempt to develop the interior, whose inhabitants had been decimated by the Zulu king, Shaka. The Afrikaner Voortrekkers entered the area via the Drakensberg passes in 1837. These Afrikaners defeated the Zulus at the Battle of Blood River in 1838 and thereafter established the Republic of Natal. Thus, the territory was once part of a short-lived Boer republic between 1839 and 1843 until its annexation by Britain. Many Afrikaner inhabitants left for the interior after the annexation and were replaced by immigrants, mainly from Britain. From 1860 onward, increasing numbers of Indians, mainly Tamils, were brought in by the British mainly to work in the sugar plantations on the coast. The colony acquired Zululand (the area north of the Tugela River) after the Zulu War of 1879. The lands north of the Buffalo River were added in 1902. Boer forces entered the area during the South African War (1899 to 1902) – also known as the second Boer War – and laid siege to Ladysmith. They failed to build on their initial advantage and for three months the line between the opposing forces followed the course of the Tugela River. In 1910, the colony became a province of the Union of South Africa and in 1961 of the Republic of South Africa. When the homeland of KwaZulu, which means "Place of the Zulu" was re-incorporated into the Natal province after the end of apartheid in 1994, the province of Natal, which had existed between 1910 and 1994, was renamed KwaZulu-Natal. The province is home to the Zulu monarchy; the majority population and language of the province is Zulu. It is the only province in South Africa that has the name of its dominant ethnic group as part of its name. The lion and wildebeest supporters are symbols of, respectively, KwaZulu and Natal, the regions joined to create KwaZulu-Natal. The zig-zag stripe represents the Drakensberg and the star the Zulu myth that the Zulu people are "star people" ("people of heaven"). The strelitzia flower on the shield symbolizes the province's beauty, while the assegai and knobkierrie behind the shield represent protection and peace. The base of the crown element is a type of headdress traditionally worn by Zulu elders that represents wisdom and maturity; the element itself is a Zulu-style grass hut. The motto is Masisukume Sakhe, Zulu for "Let us stand up and build". KwaZulu-Natal's provincial government sits in Pietermaritzburg. The foundation stone of the new legislative building was laid on 21 June 1887, to commemorate Queen Victoria's Golden Jubilee. The building was completed two years later. On 25 April 1889, the Governor of Natal, Sir Arthur Havelock, opened the first Legislative Council session in the new building. This was the former site of St Mary's Church, built in the 1860s. The congregation built a new church in 1884 at the corner of Burger Street and Commercial Road. The old building was demolished in 1887 to provide space for the legislative complex. When governance was granted to Natal in 1893, the new Legislative Assembly took over the chamber used by the Legislative Council since 1889. Further extensions to the parliamentary building were made. The building was unoccupied until 1902, when it was used without being officially opened, due to the country's being engulfed in the Anglo-Boer war. The war forced the Legislative Assembly to move the venue of its sittings, as its chamber was used as a military hospital. The Legislative Assembly and the Legislative Council buildings have both been protected as provincial landmarks. They formed a colonial Parliament of two houses: a Council of 11 nominated members and an Assembly of 37 elected members. The Natal Parliament was disbanded in 1910 when the Union of South Africa was formed, and the Assembly became the meeting place of the Natal Provincial Council. The Council was disbanded in 1986. The Provincial Legislature consists of 80 members. The African National Congress (ANC) hold power in the provincial legislature, winning the province with a convincing overall majority in South Africa's 2014 elections. After the election, the Democratic Alliance replaced the Inkatha Freedom Party as the official opposition in the province. KwaZulu-Natal is the home to the Zulu monarch, King Goodwill Zwelithini kaBhekuzulu. Although not holding any direct political power, the Zulu king is provided a stipend by the government. He holds considerable influence among the more traditionalist Zulu people in the province. To date,[when?] the Zulu king has six wives; traditionally, each year a ceremony is performed in which the king receives another wife. This was formerly a way of creating connections among the various peoples. The current King practices the ceremony, called the "Reed Dance", but has not chosen new wives recently.[when?] Instead, he has used the occasion to promote abstinence until marriage as a way of preserving Zulu culture and preventing the spread of HIV/AIDS. Durban is a rapidly growing urban area and is by most measures the busiest port in Africa. A good railway network links the city to other areas of Southern Africa. Sugar refining is Durban's main industry. Sheep, cattle, dairy, citrus fruits, corn, sorghum, cotton, bananas, and pineapples are also raised. There is an embryonic KwaZulu-Natal wine industry. Other industries (located mainly in and around Durban) include textile, clothing, chemicals, rubber, fertiliser, paper, vehicle assembly and food-processing plants, tanneries, and oil refineries. There are large aluminium-smelting plants at Richards Bay, on the north coast. To the north, Newcastle is the province's industrial powerhouse, with Mittal Steel South Africa (previously ISPAT/ISCOR) and the Karbochem synthetic rubber plant dominating the economy. In 2002, Newcastle became the largest producer of chrome chemicals in Africa with the completion of a chrome-chemical plant, a joint-venture project between Karbochem and German manufacturing giant Bayer. Other large operations include a diamond-cutting works, various heavy engineering concerns, the Natal Portland Cement (NPC) slagment cement factory, and the Newcastle Cogeneration Plant (old Ingagane Power Station). This was recommissioned as Africa's first gas-fired power station by Independent Power Southern Africa (IPSA), and it supplies the Karbochem Plant with electricity. The textile industry is a major employer in the Newcastle area, with over 100 factories belonging to ethnic Taiwanese and Chinese industrialists. Maize, livestock and dairy farmers operate on the outskirts of the city. Coal is also mined in the Newcastle area. The province as a whole produces considerable amounts of coal (especially coke) and timber. Offshore mining of heavy mineral sands including minerals with a concentration of significant economic importance at several locations, such as rutile, ilmenite and zircon are threatening the marine ecology of KwaZulu-Natal's coast, including the Tugela Banks; the fishing economy of the prawn and nurse fisheries are also threatened. About 86% of the population is Black African. During apartheid, a large percentage of native blacks was forced to live in Bantu homelands (Bantustans), which had a subsistence economy based on cattle raising and corn growing. Ecology tourism is increasingly important to the economy of KwaZulu-Natal. The area's rich biodiversity and efforts at conservation have been recognised. Tourists have come to see the iSimangaliso Wetland Park and the uKhahlamba Drakensberg Park, declared UNESCO World Heritage Sites. These two major parks and that of Ndumo have wetlands of international importance listed as Ramsar sites for conservation. Tourists pay up to $10,000 for safaris on which they might see lions, elephants and giraffes. Others come to hike in the mountains or explore the wetlands with guides. The Ingonyama Trust owns 32% of all the land in KwaZulu-Natal. Prominent civil society organisations based in the province of KwaZulu-Natal include: Abahlali baseMjondolo (shackdwellers') movement, the Diakonia Council of Churches, the Right2Know campaign, and the Unemployed People's Movement. The government in KwaZulu Natal has been under sustained controversy for their eviction of shackdwellers and mistreatment by provincial police structures that has resulted in more than 200 arrests of Abahlali members in the first last three years of its existence and repeated police brutality in people's homes, in the streets and in detention. The attack on Kennedy Road informal settlement by an armed mob in 2009 in [Durban] put local and provincial government under sustained scrutiny. It was reported by members of the Abahlali baseMjondolo movement that the attackers were affiliated with the local branch of the African National Congress and it was claimed that the attack was carefully planned and sanctioned by the provincial police department. Academic research seems to confirm that the attackers self-identified as ANC members and that ANC leaders at Municipal and Provincial level later provided public sanction for the attack. Despite a court interdict, the eThekwini municipality, with the support of the provincial SAPS, repeatedly evicted shackdwellers in Durban's Cato Crest. The General Council of the Bar has also expressed concern over the evictions. There are various game reserves found in the province; one notable example is Hluhluwe–Imfolozi Park, where the southern white rhinoceros was saved from extinction. In many of these larger reserves, large animals ranging from several antelope species to elephant, Cape buffalo and hippopotamus can be found. Predators include lions, leopards, and African wild dogs. The scaly yellowfish (Labeobarbus natalensis) is a fish found in the Tugela River system as well as in the Umzimkulu, Umfolozi and the Mgeni. It is a common endemic species in KwaZulu-Natal Province and it lives in different habitats between the Drakensberg foothills and the coastal lowlands. 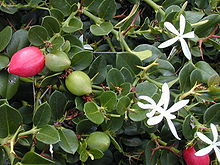 Carissa macrocarpa (Natal plum) is a shrub native to South Africa, where it is commonly called the "large num-num". In Zulu, as well as in the Bantu tribes of Uganda, it is known as the amatungulu. In Afrikaans, the fruit is called noem-noem. One of the most urgent crises facing the province is the unparalleled prevalence of HIV infection among its citizens. In 2011, South Africa as a whole had more HIV-positive citizens than any other nation. Among South Africa's provinces, KwaZulu-Natal has the highest rate of HIV infection: 39 percent, according to UNAIDS in 2009. Without the proper nutrition, health care and medicine that is available in developed countries, large numbers of people suffer and die from AIDS-related complications. In some heavily infected areas, the epidemic has disrupted society, with fatalities high among adults in their prime, and leaving many orphans to be cared for by elderly grandparents. HIV/AIDS has retarded economic growth by destroying human capital. At the 2001 census, 22.9% of KwaZulu-Natal's population aged 20 years or older had received no education; only 4.8% had received some form of higher education. Comrades Marathon, an annual marathon run between Pietermaritzburg and Durban. Midmar Mile, a mile-long swimming race held annually at Midmar Dam. Dusi Canoe Marathon, an annual canoe marathon starting in Pietermaritzburg and ending in Durban. Durban July, South Africa's premier annual horse racing event at Greyville Racecourse, Durban. Mr Price Pro, a premier international surfing event at Durban during winter (previously known as the "Gunston 500"). ^ "KZN Premier Zweli Mkhize resigns". Mail & Guardian. Retrieved 12 September 2013. ^ a b c d Census 2011: Census in brief (PDF). Pretoria: Statistics South Africa. 2012. ISBN 9780621413885. ^ Mid-year population estimates, 2018 (PDF) (Report). Statistics South Africa. 31 July 2018. p. 3. Retrieved 29 July 2018. ^ "Sub-national HDI - Area Database - Global Data Lab". hdi.globaldatalab.org. Retrieved 13 September 2018. ^ Watson, Robert George Theodor (1960). Tongaati: an African experiment. Hutchinson. p. 83. ^ My country South Africa – celebrating our national symbols and heritage, Department of Education (South Africa), ISBN 1-77018-108-3. ^ "Durban, Africa's Eastern Gem - 5 Star Durban - Showcasing Beautiful KwaZulu-Natal". 5stardurban.co.za. 9 January 2015. ^ "South African Coastal Information Centre: The Zululand coastal region.... www.sacoast.ioisa.org.za". Archived from the original on 8 May 2014. Retrieved 8 May 2014. ^ "Ingonyama Trust ruling scrutinised - IOL News". iol.co.za. ^ Shoba, Sibongakonke (7 January 2009). "South Africa: Churches Ask Parties to Preach Tolerance" – via AllAfrica. ^ "200 march against Information Bill - IOL News". iol.co.za. ^ "No mercy, no grants, says Mkhize". Archived from the original on 31 July 2013. Retrieved 10 January 2019. ^ Shack Dwellers on the Move in Durban, Richard Pithouse, Radical Philosophy, 2007. ^ "'Attackers associated with ANC'". News24. Archived from the original on 5 January 2010. ^ "Joint Statement on the attacks on the Kennedy Road Informal Settlement in Durban". Professor John Dugard SC, et al. Archived from the original on 18 October 2013. ^ The Work of Violence: Armed Attacks at the Kennedy Road Shack Settlement[permanent dead link], Kerry Chance, UKZN, March 2011. ^ "Technical Report on the State of Yellowfishes in South Africa 2007" (PDF). wrc.org.za. Archived from the original (PDF) on 29 June 2017. Retrieved 29 March 2012. ^ Dugger, Celia W. (30 September 2009). "U.N. Cites Global Rise in Detection and Treatment of AIDS". The New York Times. p. A12. Retrieved 14 June 2011. ^ Dugger, Celia W. (19 July 2009). "South Africa Is Seen to Lag in H.I.V. Fight". The New York Times. Retrieved 10 July 2009. ^ Bell C, Devarajan S, Gersbach H (2003). "The long-run economic costs of AIDS: theory and an application to South Africa" (PDF). World Bank Policy Research Working Paper No. 3152. Retrieved 28 April 2008. Wikivoyage has a travel guide for KwaZulu-Natal.